What a week! (And a weekend!) A lot has been going on and Joe and I just got back from photographing a wedding this weekend. These links may not have been posted on Friday, but they are still worth reading!!! // You guys. It’s officially hockey season!!!! In case you didn’t know, I’m a huge hockey fan, especially of the Chicago Blackhawks. Thursday night, they won their first game of the season against the Pittsburg Penguins...10-1!!! Also, I cried over this story of Bryan Bickell signing a one day contract so he could retire with the Hawks. // I don't have kids of my own yet, but I love the take that Erin at Design for Mankind has on kids and technology. // This kid’s crazy cat lady costume is my favorite! I love this so much! // I often wonder if I could pull off open shelving in our kitchen. These Kitchen Shelfies are so beautiful! // Where are my font nerds? This funny short from SNL on Papyrus has made my week! // How beautiful is this newlywed photo shoot at this couple's home? // Cutting calories doesn't necessarily mean cutting food. // In case you missed it, I talked about my love for Grove Collaborative on the blog earlier this week. // There’s a lot of hurt going on right now. Here’s how to help. Doing things that makes your life a little bit better just feels so good, doesn’t it? I love when I find a new product or things for the house that makes things easier or just a little bit new. Like when you find a new candle at the store! You bring it home, light it, and your house just feels better. I’ve been trying to be more conscious about what products I use in everyday life. I want to use and do things that promote a healthy and beautiful home. Like, for the past year or so, Joe and I have been making sure we recycle items and I’ve been trying to take shorter showers! Small steps! I knew for a while that I wanted to start using cleaning products that are more natural, and then I discovered Grove Collaborative. Grove Collaborative is awesome. They find amazing, affordable and effective natural products, like non-toxic laundry detergents and amazing smelling counter cleaners. 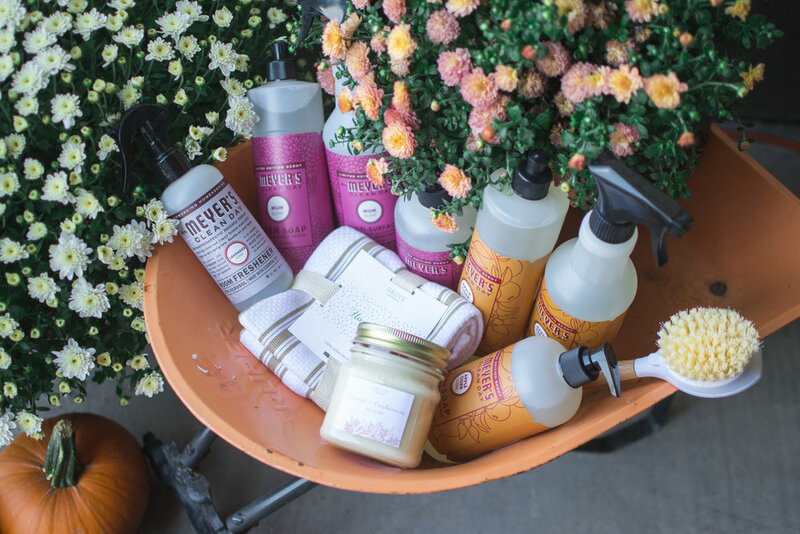 Grove Collaborative delivers products to your doorstep, on your schedule! I recently got the Grove Collaborative & Mrs. Meyer’s Ultimate Gift set which included the Apple Cider Trio, Mum Trio, a candle and tea towel and I’m in love! The Grove Collaborative Replaceable Head Dish Brush and Mrs. Meyer’s Room Fresher were free gifts with my order! I cannot tell you how good the products smell! And our house smells so clean after using them. It makes me want to clean! The best thing about it all is that the prices of the products offered on Grove Collaborative are generally better priced than the grocery store, where I would normally shop for my cleaning products. It’s really a win win! Interested? Still not sure? What if I said that you could have $10 to shop with Grove Collaborative? Because you can! Use this link to shop and get $10 off your order! Check out their fantastic products and let me know your favorites in the comments! I am so thankful for Friday’s! And the fact that it’s national coffee day makes it so much better. I tried the most awesome coffee shop in Carterville today called Crown Brew Coffee Co. Also, that donut was delicious! Joe and I have new things coming up in our lives that I’m excited to share soon! Not a bad week around here! Enjoy some awesome links and enjoy your weekend! // I have seriously considered doing a social media detox and this article is a good read on that subject. // A new way to end your day. // So often we see people's homes on Instagram and they look so clean and perfect. Justina at Jungalow photographed what her home really looks like most of the time and I love it! This is a home! // The best coffee shops in all 50 states. Who wants to go on a road trip with me??? // A brief history of knolling (overhead) photography. How did your neat flat lay Instagram photos become to be? // Support storm and disaster relief. // I certainally didn’t need these but the design but these home goods were simply too good to pass up. One & Two. // This jacket so perfect for fall. // I need a blanket and tea to cozy up with these 6 Netflix show you need to watch. It is AMAZING how doing such a small change can make your bedroom feel like you gave it upgrade. That's probably because we did! Joe and I put up a new curtain rod and blinds in our bedroom and I'm in love! I'd say new curtains, but while they are new to the room, they are quite old! I was handed these down by my parents a number of years ago when I went to live on my own. I remember them hanging in our old house in Princeton! I wanted to put something up that let enough light in the room, gave us some privacy, and that "worked" with our decor. I love the gold curtain rod we got from Bed, Bath and Beyond because it's simple looking but it dresses up the space a bit! Plus it matches the lamp stands we got as a wedding gift! We also replaced the vinyl cord blinds with some cordless blackout blinds. With Joe working third shift, we thought it would be good if he could get some good sleep during the day. These blinds really do the trick! I'm really happy with how it turned out and looks! I can't wait to upgrade some more window treatments around our house! It’s finally fall! And it was terribly hot here today... It’s crazy that last week was nice and cool and this week has been the opposite! I’m ready for a relaxing and fun weekend! Scratch Brewery in Ava has their Oktoberfest this weekend and I’m excited to eat good German food and drink good German style beer! If you missed it, I featured Oktoberfest along with other fun fall activities I’m looking forward to! Check it out and enjoy some awesome links! // This street artist is the coolest. // These ballpoint pen drawings are on point...get it? Isn't that what young people say these days? Am I still cool? // Just watching this video of a re-enactment of a wealthy woman getting dressed in 18th-century England is exhausting. // Time it takes to fall in love. // Got relationship problems? Try getting more sleep. // I included this on my birthday wish list, but I finally pre-ordered Moorea Seal's Make Yourself at Home book that comes out next week! I can't wait! // It's amazing how powerful a hug can be. // This woman finished a 10k, but stopped by every taco shop on the route. If I did things like 10k's, this would definitely be me.